The all new Uvex junior visor kids skiing helmet is the ultimate in comfort and practicality when skiing. With a specially designed lasergold lite visor shield, your child will always have the perfect view on the skiing slopes. The visor can easily be moved up or downwards and fits over glasses without fogging up so great for children who wear glasses. All the necessary technologies known from the senior models are integrated in this inmould ski helmet where the EPS is foamed directly into the impact resistant polycarbonate shell. This results in a skiing helmet that is light, yet extremely stable. The ear pads and lining can be removed and they are moisture wicking, anti-allergenic and can be washed. The innovative uvex vent system delivers optimal air circulation and reduces uncomfortable heat build-up in the helmet. The ventilation channels have been designed to quickly conduct warm air outside and pull fresh air in. And the special vent system ensures ideal ventilation. The IAS fitting system as well as the Monomatic closing system guarantee a perfect fitting and comfort. Having the same head circumference does not necessarily guarantee that a helmet can provide maximum safety and comfort. The Uvex Advanced fit systems provide the perfect adjustment, in every direction, to match every individual head shape. Lasergold lite visor - all round lens. Removable ear pads and lining. The starting point for selecting the right size is measuring the circumference of your head, a finger width above the eyebrows (the head size range is given in cm). Make sure that the helmet is positioned levelly on your head. The helmet should not sit too far back on your head, which leaves the forehead unprotected, nor be pulled too far down over the forehead, where it can affect your vision. With the adjustable sizing system (IAS system), you can fully customize the size of your helmet. To do so, place the helmet in the proper position and turn the dial at the back of the helmet clockwise to make the helmet tighter, counterclockwise to make it looser. The helmet should basically fit, the size adjustment should only be for fine tuning. You can test if your helmet sits firmly by shaking your head lightly with the chinstrap open. The position of the helmet should not change! An optimum fit is required for the helmet to fulfill its safety function 100%. Adjusting the strap system: a Remove the comfort cushion on the chinstrap. B Close the ratcheted closure. C Set the length of the chinstrap by pulling on the outer strap. The chinstrap should fit tightly, but should not hinder your breathing or swallowing! D Reattach the comfort cushion. The item "UVEX Junior Visor Pro Kids Ski Helmet, White/Grey" is in sale since Friday, October 20, 2017. 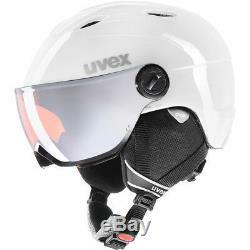 This item is in the category "Sporting Goods\Skiing & Snowboarding\Ski & Snowboard Helmets". The seller is "littleactivekids" and is located in Nottingham. This item can be shipped to United Kingdom, Austria, Belgium, Bulgaria, Croatia, Cyprus, Czech republic, Denmark, Estonia, Finland, France, Germany, Greece, Hungary, Ireland, Italy, Latvia, Lithuania, Luxembourg, Malta, Netherlands, Poland, Portugal, Romania, Slovakia, Slovenia, Spain, Sweden, Australia, United States, Canada, Brazil, Japan, New Zealand, China, Israel, Hong Kong, Norway, Singapore, South Korea, Switzerland, Taiwan, Thailand, Chile.